Night of the Proms is pleased to announce that Iconic Motown legends The Jacksons will perform in Antwerp and Rotterdam this coming November, sharing the unforgettable songs of The Jackson 5, The Jacksons, and a tribute to their brother Michael Jackson. These European dates are part of a worldwide Jacksons tour that kicks of this Summer in the United States. 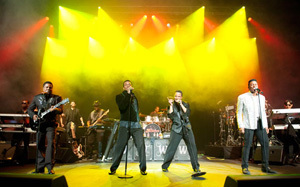 The Jacksons tour will feature founding members Jackie, Jermaine, Marlon and Tito. With their infectious brand of funky pop-soul and sunny upbeat material, The Jacksons emerged as one of the biggest pop phenomena of the 1970s. Creating some of the most vibrant pop/R&B of their era, The Jacksons remain an important centerpiece of pop culture today. Along with their immense catalogue of classic hits, The Jacksons have also been honored in the Grammy Hall of Fame and the Rock and Roll Hall of Fame. Article courtesy of Night at the Prom.